Dramatic irony at its finest. Reading Unhallowed Cathar's flavor text kind of makes me wince a little, especially imagining the look on Thalia's face when she sees Unhallowed Cathar clawing at the gates. But as a card, Loyal Cathar is a decent inclusion in any white aggro deck. A 2/2 with vigilance makes a valuable attacker because it doesn't require you to worry about leaving blockers up. The fact that it transforms when it dies also means that you can "fight without fear" *gulp! * as you don't have to worry about losing the creature. Though a 2/1 that can't block does feel like a step down from a 2/2 with vigilance, it's still a very nice feature. For one, it becomes black instead of white, which will come in handy if your opponent has pro: white creatures or Sword of War and Peace. Second, it gains the Zombie creature type. I doubt a Zombie deck would run Loyal Cathar, but the fact that it isn't a Human anymore means a Moonmist can't transform it back. Though now that I think of it, I'd almost rather the other side be a Human. But most importantly, having a Loyal Cathar on the field means that in the event of a board wipe, you get a 2/1 back and your opponent gets nothing. And since most good board wipe effects are in white, you can run your own board wipe fearlessly with this guy on the field. Which is good, because with him out blocking your opponent will have to overextend and play more creatures to get caught in your Wrath. Either that or they blow two kill spells on this guy. This card is, without a doubt, the saddest mini-story I have ever seen told through the medium of Magic art and flavor text. The most terrifying thing about zombies is the way they corrupt people who were once your friends, and make you fight against people who should have been helping you. That's before you even get to the fact that Constable Visil became the thing he was most afraid of, and the way a ghoulcaller made Thalia (and, indeed, Avacyn herself) into a liar. Does it compound the tragedy to know that this multi-layered black cosmic joke makes for a much more desirable card in our world of tabletop battlefields and FNM? Should we feel a pang of guilt every time this card transforms? Where will we find another two-cost white creature that is as resilient as this? Can we live with ourselves knowing that one of the few hedges in Standard against the fact that Doom Blade costs two mana for some reason comes at the cost of a man's soul? Today's card of the day is Loyal Cathar which is a two mana White 2/2 soldier with Vigilance that returns to play at the end step after it is destroyed transformed into a 2/1 zombie soldier that can't block. A 2/2 for two with Vigilance isn't bad, so adding card advantage makes this playable in soldier decks even though the double White keeps it from being easily splashed or as effective in multicolor decks. For Limited the double White is a more noticeable drawback and the card advantage isn't as useful when the initial 2/2 might not enter play until the later stages during which smaller creatures are often needed for blocking. Even with that any deck with enough White can benefit from playing this as a possible sustained offensive threat, especially if combined with an equipment. In Sealed a primarily White deck should always run this and in general any deck with more than a splash of White should use it as well. For Booster it should be a later pick when any creature in color is viable, but multiples should be avoided if the deck is not primarily White. Welcome to a new week of card of the day reviews here at Pojo.com. We begin looking at Dark Ascension this week, starting with Loyal Cathar/Unhallowed Cathar. Loyal Cathar costs two white mana and is a common 2/2 white creature human soldier with Vigilance. When Loyal Cathar dies, return it to the battlefield transformed under your control at the beginning of the next end step. 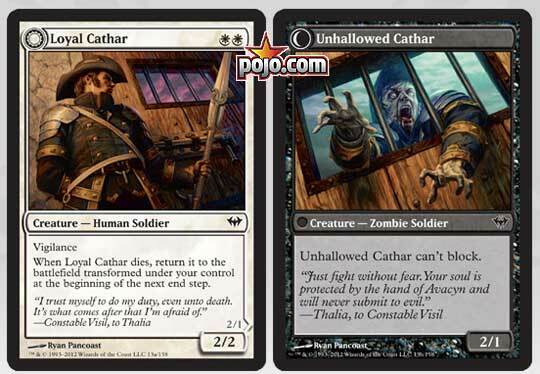 Unhallowed Cathar is a black creature that is a zombie soldier, and is a 2/1 that cannot block. Dark Ascension is a set filled with amazing cards, right down to the commons. The Loyal Cathar is no exception. Seeing how he can begin in play as a 2/2 Vigilant creature, he is able to lay down some damage and hang around to block. Then in the event of death, he returns and still is able to deal 2 damage, but loses his ability to block. Not too shabby when you consider no matter what form he is in, he is a soldier, and that means ample cards are out there that benefit. And that is just for the soldier side. As a human, there are still cards that pump him from Innistrad and coming in Dark Ascension. And once he becomes a zombie, there are tons of things zombies can do.